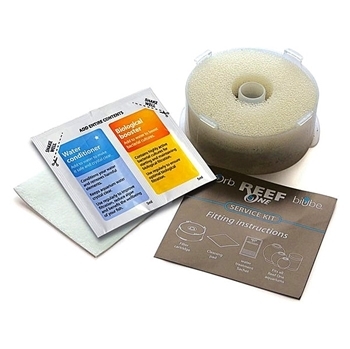 biOrb Service Kit has what you need to replace your filter cartridge and maintain your biOrb aquarium. The filter cartridge in your biOrb aquarium should be changed every 4-8 weeks*. A new cartridge is supplied in the Service Kit as well as a special cleaning pad for removing dirt and algae from the inside surface of the biOrb and water preparation chemicals for carrying out a partial water change. The kit also contains easy to follow step by step instructions. Most aquariums have filters with several compartments containing different types of filter media which needs to be carefully cut, measured and changed. Changing too much or too little can result in water quality problems. In the Service Kit this has all been done for you, so you just have to replace the filter cartridge and don’t need to worry. *Frequency of filter changes depends on the size of your biOrb and the fish stocking level. Please refer to your biOrb instructions for further details.